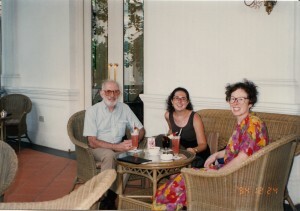 I took this photo in Singapore with my parents many years ago. Although I cut this part out of my book, what transpired on this trip was that I informed my parents that the friend they met in Hong Kong a few days earlier wasn’t just a friend. He was my fiance. It’s quite a shocker when you don’t even know your daughter is dating. But the immediate problem in the photo was this: we were at the world-famous Raffles Hotel for the afternoon, sipping Singapore Slings on the verandah, away from the other tourists. Only I’m not drinking a Singapore Sling. I ordered a Diet Coke. It’s one of the biggest travel regrets I’ve had. That and not going to St. Petersburg when it was still called Leningrad and I was just a train ride away.